Montgomery College Television Science & Technology	 Health Science Careers: The Movie follows a patient through a simulated accident, treatment and recovery, highlighting the health sciences that one can study at Montgomery College. Montgomery College offers credit programs in: - Diagnostic Medical Sonography - Emergency Medical Technician - Fire Science & Emergency Services - Health Information Technology - Nursing - Physical Therapist Assistant - Radiologic Technology - Surgical Technology For more information visit: http://www.montgomerycollege.edu/healthsciences/ Montgomery College is a public, multicampus community college in Montgomery County, Maryland. Montgomery College serves nearly 60,000 students a year, through both credit and noncredit programs, in more than 100 areas of study. Visit www.montgomerycollege.edu for more information. 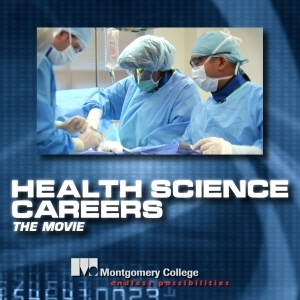 Health Science Careers: The Movie follows a patient through a simulated accident, treatment and recovery, highlighting the health sciences that one can study at Montgomery College. Montgomery College offers credit programs in: - Diagnostic Medical Sonography - Emergency Medical Technician - Fire Science & Emergency Services - Health Information Technology - Nursing - Physical Therapist Assistant - Radiologic Technology - Surgical Technology For more information visit: http://www.montgomerycollege.edu/healthsciences/ Montgomery College is a public, multicampus community college in Montgomery County, Maryland. Montgomery College serves nearly 60,000 students a year, through both credit and noncredit programs, in more than 100 areas of study. Visit www.montgomerycollege.edu for more information. Embed "Health Science Careers: The Movie" on your page.